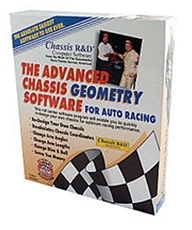 This roll center program will enable you to quickly re-design your own chassis for optimum racing performance. This program is the absolute easiest to use. Convenient data entry next to a full screen picture diagram of your chassis. Design your own car fast and easy. The windows program provides easy reading help files that cover an extensive listing of facts on demand. This software allows you to change arm angles, arm lengths, dive and roll. This program also recalculates your chassis"s coordinates for you and then shows how far each point moved after re-design of the chassis.